Originally released in 1957, this fondly remembered Gene Autry album features "America's Favorite Singing Cowboy" performing his classic Christmas songs. 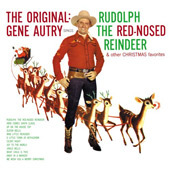 Gene's spoken introductions to his holiday hits make this unique Christmas album a very personal listening experience. 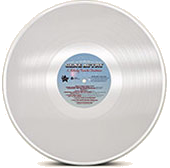 The LP has been out of print for decades, and fans could only get these specific recordings by Gene if they were lucky enough to find an LP at a flea market or rare-records store. Now through the wonder of digital restoration you can relive those cherished Christmas memories with this re-issue CD. Digitally Remastering: Bob Fisher, Pacific Multimedia Corp.
All photographs © 2006, Autry Qualified Interest Trust and The Autry Foundation. Released through the courtesy of Gene Autry Entertainment, Inc.
Reissue produced by Autry Qualified Interest Trust and The Autry Foundation. Suite 130, Studio City, CA 91604. Distributed by Universal Music and Video Distribution, 10 Universal City Plaza, Universal City, CA 91608. Unauthorized duplication is a violation of applicable laws. Printed in the U.S.A. This album is available on CD.